Several years ago, I began making Fairy Doors. 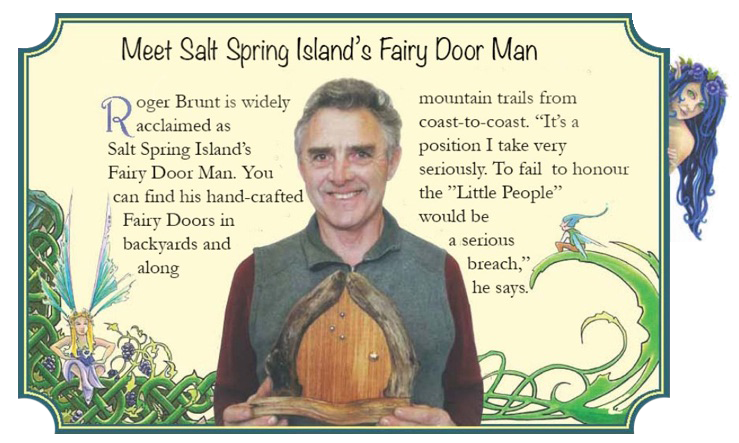 They are famous here on Salt Spring Island (and in many other places), and I wanted to see what I could do. As it turns out, I seem to have a knack for it! The elves and fairies must approve! Every door is different. It’s as if each door decides how it’s going to look. Here are samples of some of the dozens of doors I have made for customers all over North America. If you would like a Fairy Door for your children or yourself, your garden or your home, please contact me by mail, e-mail or phone. Simple doors cost $40 plus shipping, complex doors (like those that open) cost $60 plus shipping. Shipping is normally under $10.